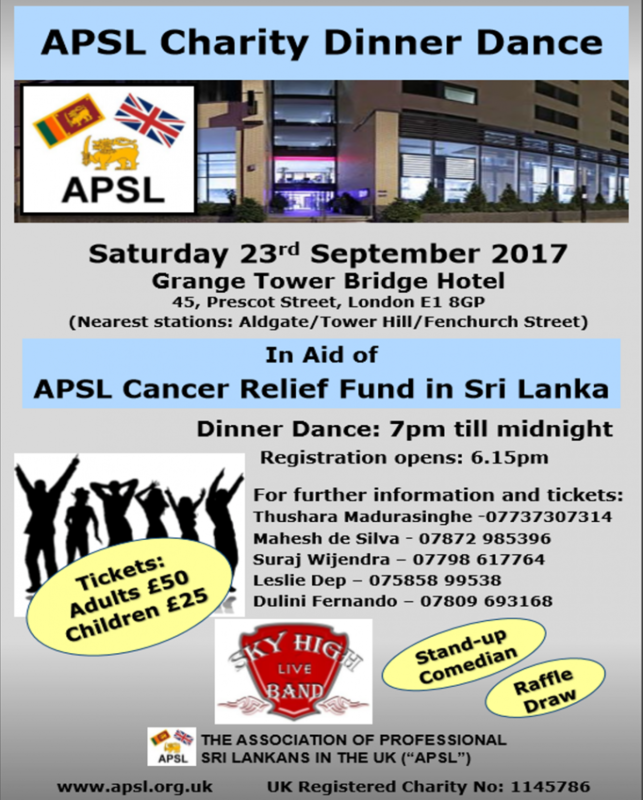 The Association of Professional Sri Lankans in the UK (APSL), launched its latest project, APSL Cancer Relief Fund at the 13th Annual Dinner Dance, held on Saturday the 23rd September 2017. The event was held at the Grange Tower Bridge Hotel, London, with the participation of many APSL members and their families, friends and well-wishers. The event began with the APSL President Mr Suraj Wijendra welcoming the guests. In his address Mr. Wijendra introduced the key theme of this year “APSL Cancer Relief Fund” and how APSL will work with communities in the UK to help patients in Sri Lanka directly when they need assistance. Furthermore, he described the past and present projects undertaken by APSL, and thanked all APSL project leaders, members and donors for their support. A highlight of his speech was how the proceeds of last year’s dinner dance was used as planned to successfully deliver a solar village for the rural village of Nochchiya in the Kurunegala District in Sri Lanka, in collaboration with Hela Sarana, another registered charity in the United Kingdom. The welcome address was followed by a presentation by Dr Dilrini De Silva and Dr Leshan Uggalla, who formally launched the APSL Cancer Relief Fund. They explained the motivation behind the project, outlining why it is important to support cancer patients in Sri Lanka. They both highlighted the numerous direct and indirect difficulties encountered by patients in the country, particularly those from rural and socially disadvantaged areas. The audience was also informed of the various ways in which the Cancer Relief Fund can help such patients. Dr Faiz Mumtaz, Consultant Urologist at Royal Free Hospital, London, delivered the keynote lecture, titled “Surgery’s past, present and robotic future”. Dr Mumtaz enlightened the audience on the key developments of surgery from the past to now, and explained how modern innovations in the use of Robotics is revolutionizing surgery, including surgery on cancer. Following a delicious Sri Lankan buffet dinner, Mr Palan, a Sri Lankan stand-up comedian entertained the audience. This was followed by a Dutch auction to raise further funds for the Cancer Relief Fund. A cricket ball signed by cricket legend Mr. Muttiah Muralitharan to commemorate the occasion of taking his 800 test wickets, was auctioned. A substantial amount of money was raised from the auction. A raffle draw was also held to raise funds for the same cause and the winners received valuable prizes. Dr Mohan Siriwardena delivered the vote of thanks on behalf of APSL. Mr Thushara Madurasinghe and Ms Paola Bethmage compered the event. Attendees danced their way late into the night to the live music provided by Sky High band. The event ended well after midnight with the signing of the national anthems of UK and Sri Lanka. APSL wishes to thank the Deputy High Commissioner for Sri Lanka to the United Kingdom Mr.Sugeeshwara Gunaratna & Mrs Gunaratna, Counsellor (Consular) Mr Manoj Warnapala & Mrs Warnapala for accepting our invitation and attending the event. Furthermore, APSL wishes to thank the following for their contributions in making this event a great success. Dr Faiz Muntaz for delivering a highly informative keynote lecture, Mr Kushil Guanasekara (Foundation of Goodness Sri Lanka), and the sponsors of the event – Sri Lankan Airlines, Mike Cooke Group, Rising Sun Hotel, Atlas Shipping, Blue Ocean Group of Companies, Unique Solicitors, Duke’s Court Travel, Mass Global Shipping, Perera & Co, Overseas Reality (Ceylon) PLC and Havelock City Apartments for providing advertisements and to many individuals who made donations to the cancer relief fund, Grange Tower Bridge Hotel for hosting the event, Mr Manjula Munasinghe -Sky High band for providing music and entertainment, Mr Palan for providing a unique Sri Lankan stand-up comedy, Mr Ranjan Perera for conducting the Dutch auction, Mrs Gayani Senaratne for organising the raffle, Dr Mahesh de Silva and Dr Dilrini De Silva for preparation of the newsletter, event photographer Mr Sisira Maddumage, media organisations Newslanka newspaper and Sesatha website for providing publicity, all members of the APSL Executive Committee, all APSL members, friends and well-wishers who attended and made a valuable contribution on the day. It is with great pleasure that we would like to inform that APSL will be hosting its 13th annual fund-raising dinner dance this year at the Grange Tower Bridge hotel in London on 23rd September 2017. The aim of this year’s fund-raising event is to provide much needed medicines and other support to Cancer Patients in Sri Lanka by establishing APSL Cancer Relief Fund in Sri Lanka . Patients with cancer and their families face both emotional and financial challenges, therefore we wish to donate all proceeds from this event to the needy patients currently undergoing treatments in Sri Lanka. Every year this annual event is dedicated to fund a worthy cause/project in Sri Lanka and last year we raised funds to build a Solar Village Project in Sri Lanka, which was successfully completed at Nochchiya village in Kurunegala district and handed over to the village development committee in January 2017.